It is our mission to develop effective and confident communicators who will be leaders in science and health-related fields. Sweet Briar psychology graduates are well ahead of their peers when it comes to research and internship experiences, which are as important for intellectual and personal growth as they are for our curriculum and a student’s résumé. The subject matter of psychology spans both the biological and the social sciences and we encourage each student to develop her scientific skills in the context of a liberal arts education. What is distinctive about studying psychology at Sweet Briar? Our students conduct original research and carry out statistical analyses using professional software. Many work closely with individual faculty members on projects that span several years, an experience characteristic of top graduate programs. They communicate effectively about their interests in a wide variety of settings and are able to prepare reports based on thorough data analysis and careful consideration of information. They learn how to effectively give and receive constructive feedback and demonstrate awareness of their own strengths and weaknesses, their options and where they are most likely to thrive. They receive letters of recommendation from faculty who know them well and can communicate their individual strengths. They join a successful alumnae network that includes a disproportionate number of leaders and thinkers in psychology and other related fields. We use our classroom experiences to train students in the practical skills of the profession as well as in skills needed in the workplace. Students may even take on a yearlong internship that is tied to their career goals. Our community partners benefit greatly from a group of trained and polished “expert” helpers. Senior students work with the clinical tools of our profession and may conduct a psychological battery of tests on a student volunteer. Students in forensic psychology examine criminal behavior from a psychological perspective examining the efficacy of eye-witness testimony, “emotional remembering” and the logical and illogical processes of the mind. 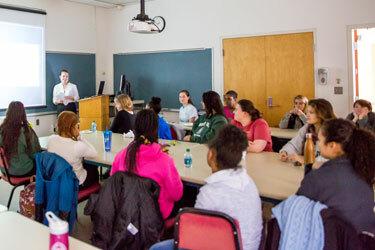 Sweet Briar psychology majors enter graduate training programs at a rate much higher than the national norm. Approximately 80 percent are accepted into graduate programs. Some of them are the University of Michigan, Duke University, the University of North Carolina — Chapel Hill, Yale University, University of California at Berkeley, Boston College, University of Virginia and the University of Pennsylvania.